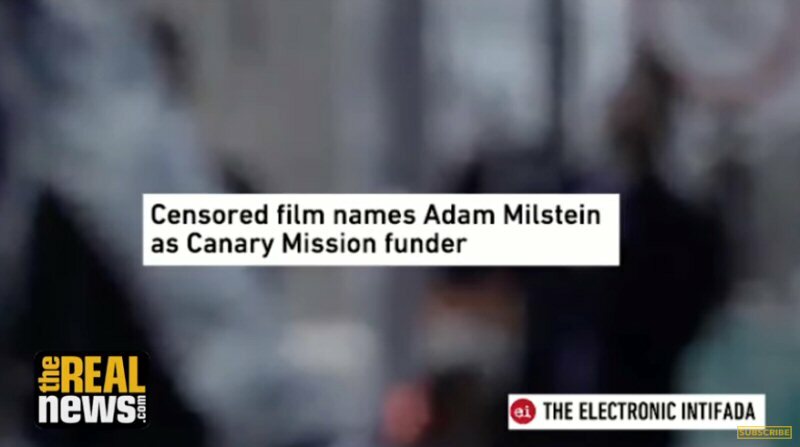 The first leaked excerpt of Al Jazeera’s censored film on the Israel Lobby in the U.S. claims to identify the funder behind the Canary Mission, an anonymous website devoted to smearing and silencing vocal supporters of Palestinian rights. TRNN plays a clip from the film and speaks to Asa Winstanley of the Electronic Intifada, which exclusively revealed it. Today we are showing you the first excerpts of the film the Israel lobby does not want you to see. The news channel Al Jazeera sent undercover journalists into pro-Israeli government groups in the United States. Among several things, they uncovered closely-coordinated efforts by these groups and the Israeli government to monitor, smear, and intimidate U.S.-based defenders of Palestinian rights. The film is called The Lobby USA, but it has never been released. That’s because the Israeli government and the Israel lobby pressured Qatar to censor it. Qatar, which owns Al Jazeera, caved to that campaign, citing national security. But, that censorship has not buried the film for good. The website Electronic Intifada has obtained the first excerpts of the film. But, before we go to that excerpt we’re going to speak first to the journalist who obtained it. Asa Winstanley is the independent journalist and the Electronic Intifada’s associate editor. Welcome, Asa. And, in this clip, Eric Gallagher, who was at that time the development director for another group the Milstein funds called the Israel Project, is speaking to Al Jazeera’s undercover reporter, who was interning at that time with the project. And he sort of, he’s basically trying to get in good with him, and he’s telling the reporter that- well, you’ll see in the clip. But, on matters such as this, when it points to pressuring people, trying to intimidate activists, intimidate voices, brave defenders of Palestinian rights, and wielding a large amount of money toward that end, I think that this film and the revelations that you’ve been uncovering at the Electronic Intifada provide a stark illustration. And, of course, in terms of impacting congressional races, because the Israel lobby can raise a lot of money there. But, I just think that the fact that this film has exposed the secret maneuverings to combat activism speaks to where the Israel lobby is most influential and insiduous in the U.S.
AARON MATE: You know, it’s interesting what you say there about the vetting process in the UK, because as I understand it the film also went through a vetting process here in the U.S., where people like Adam Milstein were given an opportunity to reply to the film’s revelations. But, as I understand it, Milstein and others declined that opportunity, right?